American Cruise Lines- Historic South and Golden Isles Cruise March 19-26, 2016 We arrived in Charleston two days prior to the cruise departure and stayed at the Hyatt Place historic district on King St. 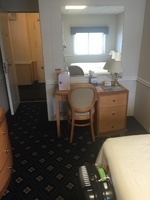 The hotel is only 5 months old and the accommodations were very nice and convenient to shopping and dining in the King St. area. I would caution anyone against ordering any foodstuffs from the “Pickup and Go Menu” in the rooms as these items are all pre-packaged and hardly edible to say the least. There are plenty of local eateries offering a wide selection of lunch and dinner options all along King St. that would be a far better choice and cost about the same. On the other hand, the downstairs daily hot breakfast at the Hyatt was quite good and plentiful. We left for the City Marina on Lockwood Dr around 10 am on Saturday and were the second to check in. ACL representatives met us at the end of the pier and took all luggage to the ship at that time. They also provided golf cart rides out to the ship for those with limited mobility. Cabins were not available until 11:30 or so and we were directed to the Chesapeake lounge where warm cookies, soft drinks, coffee, water and espresso were available. These were available all throughout the cruise at no charge. Surprisingly enough the ship also furnished free WiFi during our cruise. When we entered our cabin there were nice ACL lanyards, nametags, and room keycards along with a folder of information about our cruise and staff. We were in cabin 212, an AAL balcony cabin adjacent to the mid-ship lounge. We liked our location so much due to the proximity that we booked the same one for our next cruise. 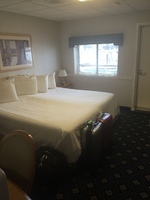 The décor was a bit dated looking but the cabin was very clean and the staff maintained that during our cruise. The AC was good as I kept the temp in the high 60’s most of the time. Each day offered delicious meals in the dining room on the first level and were among the best we have had in our cruise history. Breakfast service began at 7:30 am and choices included both hot and cold items. A table just inside the dinning room featured cold selections such as yogurt and fruit parfaits, smoked salmon and capers with bagels and cream cheese available on request, and various pastries. Hot, cooked-to-order options were provided on menus at each place setting. The reverse side of the breakfast menu featured the day’s selections for lunch and dinner as well as places to indicate whether you’d be dining off-ship for any meals. You would make a selection from offered appetizers and entrees so that the chef would have a better idea of how much of the various dishes to prepare. This was an excellent way to prevent a lot of waste with uneaten foods which ultimately helped the kitchen deliver better-cooked, more flavorful meals. Lunch commenced at 12:30pm. In addition the appetizer and entrée, dessert options were available. If you missed lunch onboard due to an excursion, the staff provided options for boxed lunches with ham or turkey sandwiches that you could take with you. We did this one day and were really surprised at how good the sandwiches were and how much they put into the boxes. The evening’s meals began with a cocktail party at 5:30 in the Chesapeake lounge and featured heavy hors d’eouvres which changed nightly. It’s worth noting that if you have a favorite brand of liquor, you can simply call the home office with your booking number pre-cruise and they’ll have it onboard for you. Dinner followed in the dinning room at 6:30. They started with appetizers and always had a soup option. The soups were outstanding and some of the best any of our four had ever had. Entrees followed and varied from seafood to beef, chicken, pork and lamb. One evening we enjoyed filet so tender you could cut it with your fork. Desserts were good as well and there were about 8 different kinds of ice cream which were always available. The servers were attentive and friendly which made for pleasant meals. We took at least one shore excursion in each port and were pleased with the cost of each. The ship was able to dock in all but 2 ports (Hilton Head and Sapelo Island) and for those we had only a short tender ride to shore and back. Toward the end of the cruise there was a presentation about future cruises with an offer to book while onboard for 15% off and free port charges and taxes ($500). If should be stated that there was no pressure and we were not asked but the one time. We were not hounded to book additional cruises. However, after consulting with our traveling companions, we did book a future cruise to the New England Islands. Being long-time Princess cruisers we were amazed at the free drinks, cocktails and coffees not to mention the free internet. The only downside we could come up with was the lack of laundry as we usually send out clothes a couple of times during a cruise. There were no telephones in the cabins; but since nothing was more than 100 feet from our cabin door none were needed. On the wall next to the desk was a large red emergency call button if anyone were to have need for assistance. All in all, we had a wonderful time and felt the value for the money was very good. The crew were all very friendly and accommodating. They really wanted us to have a great time. Obviously we’d do it again as we booked another cruise with ACL. We arrived in Charleston two days prior to the cruise departure and stayed at the Hyatt Place historic district on King St. The hotel is only 5 months old and the accommodations were very nice and convenient to shopping and dining in the King St. area. I would caution anyone against ordering any foodstuffs from the “Pickup and Go Menu” in the rooms as these items are all pre-packaged and hardly edible to say the least. There are plenty of local eateries offering a wide selection of lunch and dinner options all along King St. that would be a far better choice and cost about the same. On the other hand, the downstairs daily hot breakfast at the Hyatt was quite good and plentiful. We left for the City Marina on Lockwood Dr around 10 am on Saturday and were the second to check in. ACL representatives met us at the end of the pier and took all luggage to the ship at that time. They also provided golf cart rides out to the ship for those with limited mobility. Cabins were not available until 11:30 or so and we were directed to the Chesapeake lounge where warm cookies, soft drinks, coffee, water and espresso were available. These were available all throughout the cruise at no charge. Surprisingly enough the ship also furnished free WiFi during our cruise. When we entered our cabin there were nice ACL lanyards, nametags, and room keycards along with a folder of information about our cruise and staff. We were in cabin 212, an AAL balcony cabin adjacent to the mid-ship lounge. We liked our location so much due to the proximity that we booked the same one for our next cruise. 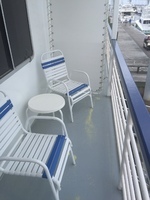 The décor was a bit dated looking but the cabin was very clean and the staff maintained that during our cruise. The AC was good as I kept the temp in the high 60’s most of the time. Each day offered delicious meals in the dining room on the first level and were among the best we have had in our cruise history. Breakfast service began at 7:30 am and choices included both hot and cold items. A table just inside the dinning room featured cold selections such as yogurt and fruit parfaits, smoked salmon and capers with bagels and cream cheese available on request, and various pastries. Hot, cooked-to-order options were provided on menus at each place setting. The reverse side of the breakfast menu featured the day’s selections for lunch and dinner as well as places to indicate whether you’d be dining off-ship for any meals. You would make a selection from offered appetizers and entrees so that the chef would have a better idea of how much of the various dishes to prepare. This was an excellent way to prevent a lot of waste with uneaten foods which ultimately helped the kitchen deliver better-cooked, more flavorful meals. Lunch commenced at 12:30pm. In addition the appetizer and entrée, dessert options were available. If you missed lunch onboard due to an excursion, the staff provided options for boxed lunches with ham or turkey sandwiches that you could take with you. We did this one day and were really surprised at how good the sandwiches were and how much they put into the boxes. The evening’s meals began with a cocktail party at 5:30 in the Chesapeake lounge and featured heavy hors d’eouvres which changed nightly. It’s worth noting that if you have a favorite brand of liquor, you can simply call the home office with your booking number pre-cruise and they’ll have it onboard for you. Dinner followed in the dinning room at 6:30. They started with appetizers and always had a soup option. The soups were outstanding and some of the best any of our four had ever had. Entrees followed and varied from seafood to beef, chicken, pork and lamb. One evening we enjoyed filet so tender you could cut it with your fork. Desserts were good as well and there were about 8 different kinds of ice cream which were always available. The servers were attentive and friendly which made for pleasant meals. We took at least one shore excursion in each port and were pleased with the cost of each. The ship was able to dock in all but 2 ports (Hilton Head and Sapelo Island) and for those we had only a short tender ride to shore and back. Toward the end of the cruise there was a presentation about future cruises with an offer to book while onboard for 15% off and free port charges and taxes ($500). If should be stated that there was no pressure and we were not asked but the one time. We were not hounded to book additional cruises. However, after consulting with our traveling companions, we did book a future cruise to the New England Islands. Being long-time Princess cruisers we were amazed at the free drinks, cocktails and coffees not to mention the free internet. The only downside we could come up with was the lack of laundry as we usually send out clothes a couple of times during a cruise. There were no telephones in the cabins; but since nothing was more than 100 feet from our cabin door none were needed. On the wall next to the desk was a large red emergency call button if anyone were to have need for assistance. All in all, we had a wonderful time and felt the value for the money was very good. The crew were all very friendly and accommodating. They really wanted us to have a great time. Obviously we’d do it again as we booked another cruise with ACL. Decor a bit dated but roomy and very convenient.